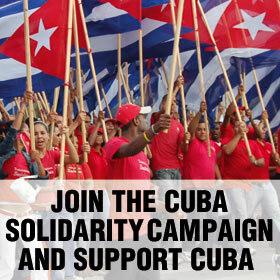 Over 400 national, regional and branch trade unions are affiliated to the Cuba Solidarity Campaign and many have links with their sister unions in Cuba which we can help to set up and maintain. Please consider affiliating to CSC. It costs as little as £40 per year. You can affiliate online here or download the affiliation form here. If you think you are already affiliated to CSC, please get in touch and we can check. Please also get in touch if you would like a model affiliation motion or have any questions. Read the pamphlet 'Workers in Cuba: unions and labour relations', by Debra Evanson and Steve Ludlam, online here. Over 20 national trade unions are currently affiliated to CSC representing over 95% of Britain’s unionised workforce. ASLEF The Associated Society of Locomotive Engineers and Firemen has been affiliated to CSC since 2002. BECTU The Broadcasting, Entertainment, Cinematograph and Theatre Union has been affiliated to CSC since 2001. BFAWU The Bakers, Food and Allied Workers’ Union has been affiliate to CSC since 2001. Community Community has been affiliated to CSC since 2003. CSP The Chartered Society of Physiotherapy has been affiliated to CSC since 2002. CWU The Communications Union has been affiliated to CSC since 2001. FBU The Fire Brigades’ Union has been affiliated to CSC since 2001. GMB The GMB has been affiliated to CSC since 2001. MU The Musicians’ Union has been affiliated to CSC since 2001. NAPO NAPO has been affiliated to CSC since 2001. NASUWT NASUWT has been affiliated to CSC since 2006. NUJ The National Union of Journalists has been affiliated to CSC since 2001. NUM The National Union of Mineworkers has been affiliated to CSC since 2002. NUT Britain’s largest teaching union has been affiliated to CSC since 2001. PCS The Public and Commercial Services Union has been affiliated to CSC since 2005. POA The Prison Officers’ Association has been affiliated to CSC since 2008. RMT The Rail, Maritime and Transport Workers’ union has been affiliated to CSC since 2001. TSSA The Transport Salaried Staff’s Association has been affiliated to CSC since 2001. TUC The Trade Union Congress has passed a number of motions in support of Cuba, the Miami Five and CSC. A number of TUC Regions and local trades councils are affiliated to CSC. UCU The University and College Union has been affiliated to CSC since 2001. UNISON Unison has been affiliated to CSC since 2002. Unite Unite the Union has been affiliated to CSC since 2001. USDAW The Union of Shop, Distributive and Allied Workers has been affiliated to CSC since 2001.